After my ‘homeless’ experience in Bristol last November, I decided to try one in London for ‘The Big Issue Foundation’ (TBIF) last week. After returning home from the Sidmouth Folkweek, I quickly grabbed a few things including a sleeping bag and headed to Taunton for the 1631 train to London Paddington. This should have been a simple journey with one stop at Reading before arriving at LP at 1820. We arrived at Reading on time and waited for a few minutes before the train manager apologised for the delay but said we would leave shortly. Another few minutes and another apology that we were waiting for a space at LP. 20 minutes passed and we were told our train was terminating and to get onto the train on the adjoining platform which caused a mad rush to get a seat. We all settled into our seats and waited, and waited until guess what? We were told to get back onto the other train! I waited by the door until I knew it was about to leave until eventually, the announcement cam that all trains to Paddington were terminated and the staff admitted they didn’t know what we should do. Perhaps I was going to do my Sleep Out at Reading? I hung around waiting for further instructions until around 7pm when I walked up to the station’s main concourse and was approached by a representative from a charity who was going to try and get me to sign up to something. I pointed out that I was wearing a ‘Big Issue’ t-shirt and was trying to get to London for a charity sleep out. ” Why don’t you catch the train to Waterloo?” he asked. “How do that?” I replied. “Down there on Platform 6. Their running fine.” I thanked him and joined a large line of passengers waiting to board. The email from TBIF said to arrive from 7.15 but not later than 8pm. It was already 7.15 and on asking a fellow passenger, she told me we wouldn’t get to Waterloo before 9pm. I chatted with Sylvie who had been on holiday to Pembrokeshire. She spotted my wristband from the Folkweek and is familiar with Halsway Manor having been on residential there. Sylvie lives near Waterloo and also works in a first school. “If you get stuck, you can sleep on my floor or if you want to be outside, I have a balcony.” A kind offer but I was going to try and find this railway arch I should be sleeping in. We arrived just before 9pm and I went out into the streets and walked towards Vauxhall. My quickly drawn map indicating Lambeth Bridge and Lambeth High Street wasn’t as easy to follow as I had hoped. I was walking back and forth to find the High Street as I had found the bridge fine. I asked one group who didn’t think there was such a place while others looked at me with my Big Issue top, sleeping bag and carrier bag not wanting to engage in conversation! It was now past 10pm and I spoke to a doorman at a pub and explained what I was up to. He said to try the side street next to us which I did to no avail then as I returned back up the street, he had found the location on his phone. A few minutes later, I was in Newport Street where I found some arches all locked up and all very dark. Not the sort of place I wanted to be on my own for too long. I saw a door open and inside, spotted some people in TBIF t-shirts. “This is where I should be!” I said. A security guard let me in and someone went to find Justine who had organised the event. Justine was pleased I had got there having wondered where I’d got to. 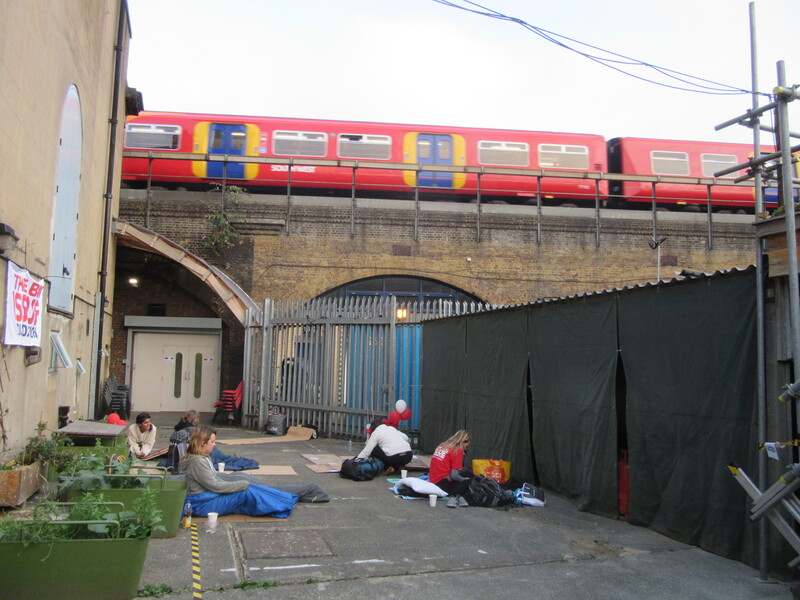 “You can sleep in the yard or inside the railway arch.” I had been looking forward to the arch so put my sleeping bag down and returned to the room where everyone was gathering for some entertainment. “You’re just in time to buy some raffle tickets before we draw them. £2 each or £10 a strip.” I bought a strip and wrote my name on the reverse. I had missed the discussion where the CEO of TBIF and street vendors had been talking about what they do although I have written about causes of homelessness in my previous article. Family break ups, domestic abuse and financial problems are big causes. Many of you will know the story of former Big Issue vendor James Bowen who, in 2007 while recovering from heroin addiction, found an injured and starving cat curled up on a step. James decided to take the cat to the RSPCA who gave the animal a course of antibiotics which cost £28. This was just about all the money James had. “I’ve always loved cats.” says James. James lived in sheltered accommodation and had lived a difficult life in Australia. Living rough in London, James had been surrounded by others using drugs and before he knew it, had entered the same world feeling he had nothing to lose. Back to the sleep out, the raffle was drawn and first ticket out for a pair of TBIF mugs was announced as “Keith”. “Thank you” said and sat down again while the next ticket was drawn for some tickets to a concert. “Again, that’s Keith!” “Let someone else have a go.” I said. Jane one them this time. In fact, myself and Jane ended up with most of the prizes with myself winning the mugs, a tote bag and case of mixed ales from the East London Brewery Company. Next, we were entertained by the Adam Street Singers. A fabulous group of young people who work across London in The City, hospitals plus tv and film. If you check them out on Google or YouTube, you will see that they get songs and mash them up creating a wonderful sound that makes you smile. If you type in ‘The 19:57 from Euston’ ‘ you will see a video that went viral when one of the members made a marriage proposal. At the end of the evening, I went back inside the cool and damp railway arch and tucked up inside my sleeping bag. As I lay there, there was a sound and feel of trains thundering in and out of Waterloo with around one a minute until 1am. All was fairly quiet then and I could catch some sleep until 5am when the first trains woke me up. Living in a rural area, I’m lucky enough not to have this life every night though in reality, many homeless people sleeping rough in London will sleep during the day as they feel too vulnerable at night and tend to stay on the move. After some breakfast and saying goodbye to everyone, I headed off onto the streets of London and along the South Bank to enjoy the early morning views of the river and the city waking up before my journey back home to Somerset.